We are pleased to announce our LCD plug in for the Raspberry Pi B+ and RPi 2. This is a full sized board, designed primarily to be used with our FLAT Pi. However, with an extra connector fitted, it can be stacked directly onto a Raspberry Pi. Alternatively, a short flat cable extension is offered. The display uses the HD44780 driver chip in 4 bit parallel mode. The connections are taken to the GPIO pins only available on the 40 way GPIO header. 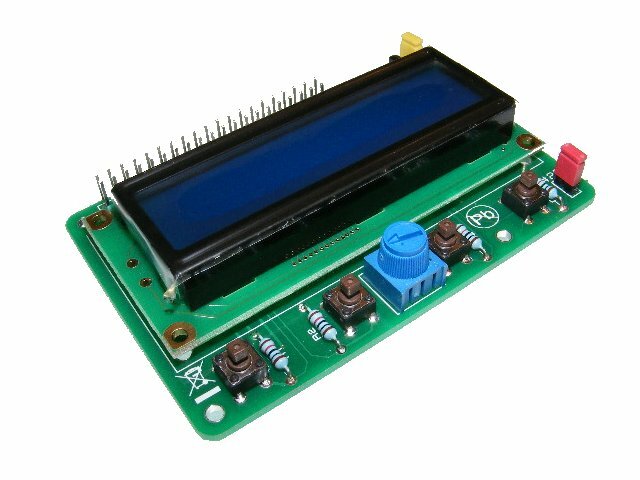 This avoids any conflict with the built in serial comms, I2C, SPI and UART although a link option is provided to connect the LCD backlight to the PWM output. There are 4 push button switches which again are assigned to pins only found on the 40 way header.